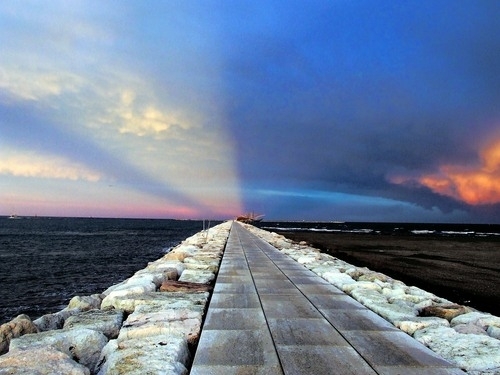 The deflection of the Brenta River from the lagoon and the drainage of the whole area at the end of the 19th century, the building of the South dam of the Port of Chioggia (San Felice) during the 1930s, contributed to transform the territory and the consequent shaping of the beach of Sottomarina. Thanks to their accumulation, the River debris enlarge the shoreline of about three metres every year. Nowadays you can stroll over the dam of Sottomarina till the lighthouse enjoying the magnificent natural landscape of the sea that often surprises visitors with unexpected and amazing dolphins’ waterworks.